Fig. 1. Pecan trees at Site I in Riverside Co. The limited availability of water is a growing concern and focuses research goals on the need for water conservation and efficient water use. Knowledge of root-zone soil water content variation is essential for evaluating and improving the efficiency of water application in orchard crops. 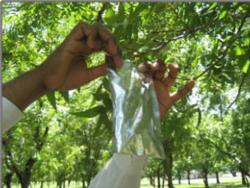 This component of the project involves research in Pecan. In addressing our goal of providing an efficient management of orchards in arid regions, we are investigating the complex water relations among soil, tree and atmosphere. Through our research in Pecan orchards, we are developing an understanding of the tree response to gradual variations in root-zone soil water content and the depletion of soil water. 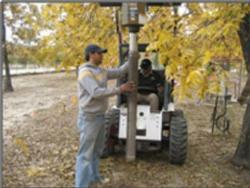 To determine patterns of variation in SWD with depth and with location within canopy under different soils. We are also investigating these patterns on bare soil within the orchard area. Extensive SWD and SWP measurements were taken to understand their relationship: that is, to observe changes in water content of the stem in response to water content of the soil in the root zone. 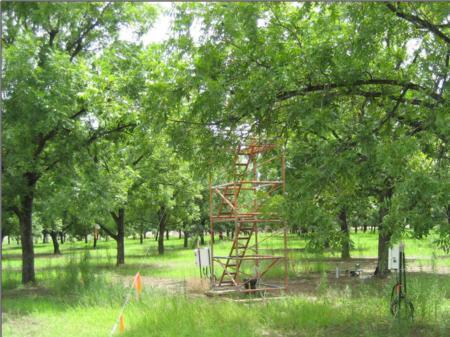 Root zone soil-water was monitored from May to December for two seasons (2009 and 2010) in two pecan orchard sites under flood irrigation; soil-water sensors were installed at four depths within the dripline of three representative trees per orchard, replicated four times. Continuous soil water content was measured and SWD was calculated daily. 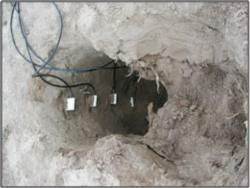 Soil core samples were taken and soil properties such as particle size, density and water content were determined, to provide a detailed temporal and spatial description of the root zone. Roots were extracted for these core samples to measure Root length density (RLD). RLD is an important parameter in evaluating the influence of root pattern on water and nutrient uptake. Weather data including air temperatures, solar radiation, precipitation and relative humidity, was collected from stations near the orchard sites. Soil Water Depletion (SWD): a root zone measurement of the amount of water within the soil. When measured at time intervals, SWD is an indicator of water stress within the tree. Fig. 2. Sensors in soil.